Adiatma is back with another review - take it away! Hello guys. I’m back with another review. It’s my second review this month. It starts to become a hobby itself. By the way, this is my second straight transformable toy. Yes, The movie has got me. On with the review. I’m not going to talk about the movies, because probably the readers of this site has been talk about it since last year. But I’m going to tell you a little story about my friend. He asked me if there’s a transformers toys that not been made in China. Well, I told him that 95 % of toys in the world are made in China. Even Takara ones. I guess he's disappointed about the quality in Hasbro’s Transformers toys. Why… is true… let’s check it ourselves. 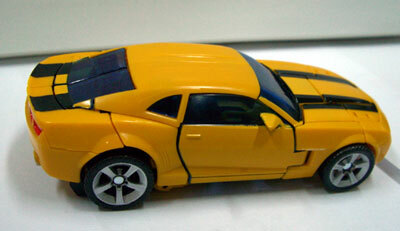 I picked up the Concept Camaro version since the old Camaro is nowhere to be found. Some of the movie lines have been reviewed by Jin Saotome. I’m just picking up the pieces here. As with other TF Movies lines, they are kind of blister packaged. The package, using latest Hasbro’s “technology,” gives the buyer chance to take the toys without tearing up the package. In fact, the picture I’d taken is after I open the package. Neat, eh… but the downside if too much space being unused. First things first. 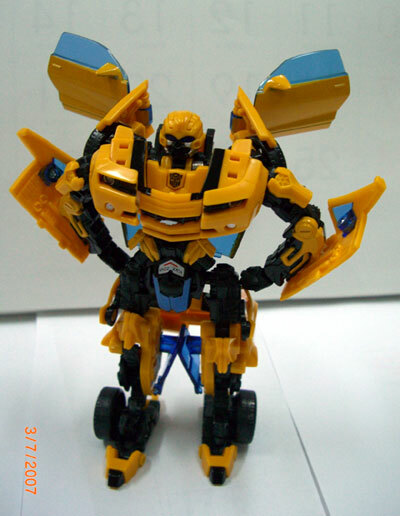 The movie’s design can’t be translated perfectly into transforming toys (yet). So I’m not going to compare to the movie’s version, although it has some likeness. The sculpt itself is okay. 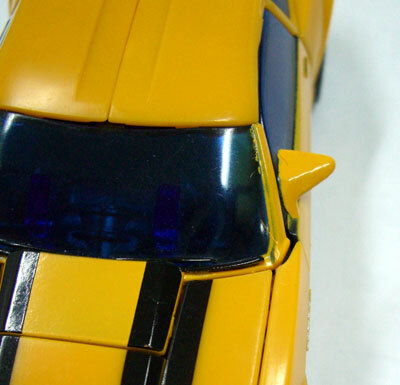 In car mode, the panel lines are there. In robot mode, there are the little engineering things. 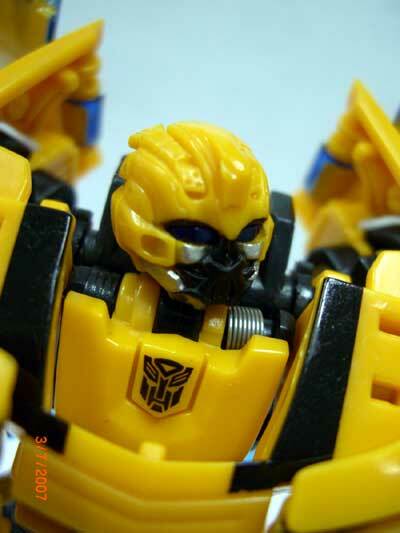 The “alternative” incarnation is enough to represent Bumblebee. So although it’s not movie perfect, it can live up to the name Bumblebee. Easily the worst thing in this toy. The story I was mentioned before… well that because the paint is bad… as Michael says bad paint can ruin a good sculpt. 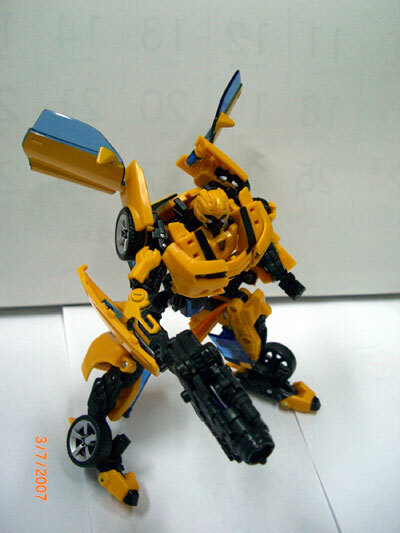 First, As far as I know, the inner frame of Bumblebee is metal like silver. But Hasbro choose to paint him black. Different design is forgivable because the complexity of the design. But paint… bad… very bad. Second, many paint blobs, and out of the line paints. Such a shame. 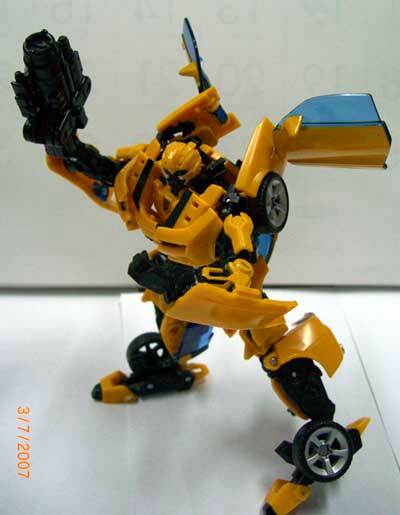 Ball jointed Neck, Ball Jointed arms and hands, ball jointed legs and ball jointed torso… on a transformers toys! Add cut and swivel joints in arms and legs. That a lot of joints. The skinny frame help to pose him in a lot of ways, too. Too bad some joints not fully functionally. (e.g. : the neck, although ball jointed, had a limited movements courtesy of transforming design). Apart form Masterpieces series, recent transformers vehicle forms is somehow, futuristic. So when The movie is based on actual cars. I’m jumping with joy. And this toy doesn’t disappoint either. The transform, although a bit difficult, is worth every twist. The Camaro look like…. A Camaro. Not some intergalactic cars. 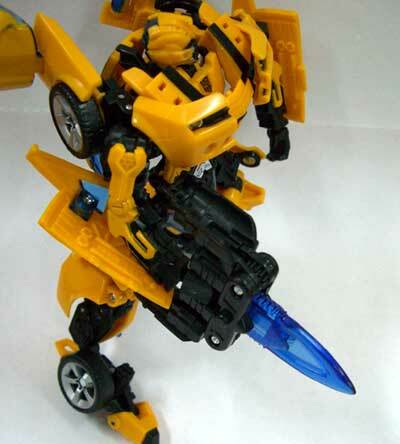 You can even store Bumblebee’s weapon in the back as part of the car. Neat and ingenious mechanism. Let me check… gun that can change into sword… and…. Nothing… An alternative Battle head, hands or even the cube is a welcome addition, but maybe I’m asking to much. Transformers was never meant to be full of Accessories. As long as it can transform. Strong joints meant transforming is a fun things to do. You’ll be transforming this toy back and fourth a lot. 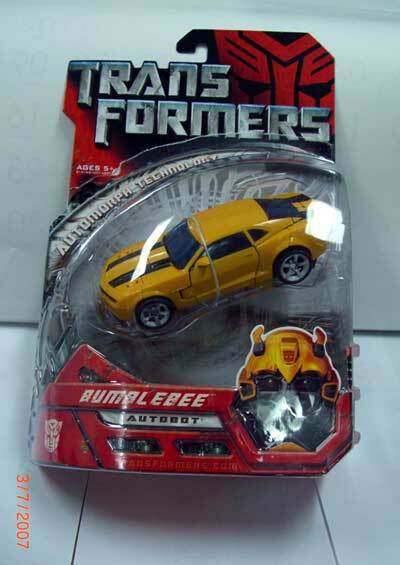 Kids going to love bumblebee’s character. So it’s going to attract young and old ones. Although transforming process is a bit difficult, minor (and adults) going to get used too. Deluxe Class standards of ten bucks (although they charged it too high in my country). But as for you who lucky enough to bought this a 10 $, considering it’s a worth every penny. Not a steal, but a good bargain. Pick for the best paint applications. That’s it. I tread this figure as a toy to play as well you can collect. Surely it doesn’t disappoint me in terms of toys. But to be collector items, Hasbro has to improve their paint aps. But it’s worth the wait, just like the movie. I hope Takara release their movie version Masterpiece. 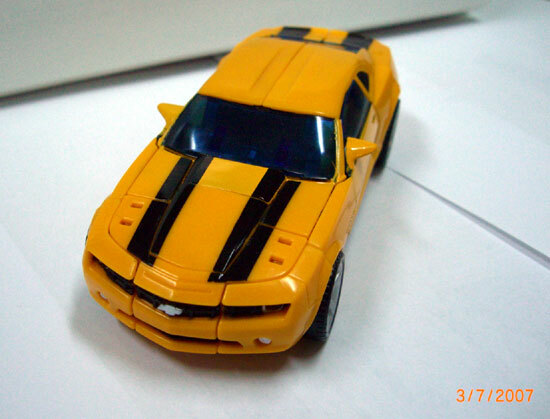 As for now, maybe this is the best movie Bumblebee (in terms of quality and value) yet, until someone review the ultimate Bumblebee. Thank you for reading my review. Autobot… transform and roll out. It’s everywhere! Toy stores, internet, you won’t have any trouble picking it up. Figure from the collection of Adiatma.